Interested in certain topics? Browse content from specific categories and tags by simply clicking on the pertinent word below each post. 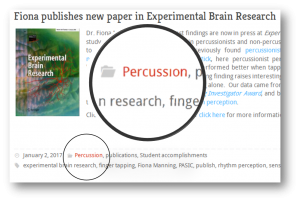 For example, clicking on the “Percussion” category will open a new page that shows all the posts that have been sorted under “Percussion” category.